Summer is now officially over, with today the first day of Fall. The fishing has slowed a bit from the peak of summer, but there's still salmon around for those in the hunt. 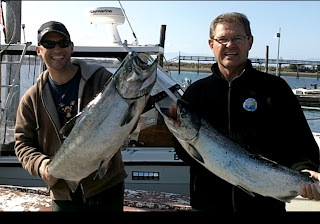 Roy from Blue Wolf Fishing Charters sent in this photo of a good day last week ... 12 fish caught in two days, assorted chum, coho, pinks, and a beauty 38 lbs chinook caught off Otter Point. As well, Neil from Salty Towers reported a nice 30 pounder caught by someone on their dock today. Location unknown! Below is a photo of a trip earlier in September. A lot of people have switched to chasing coho in the deeper water, 400-600 foot depths. There are a mix of wild and hatchery coho up to 10 pounds ... scrappy fighters. 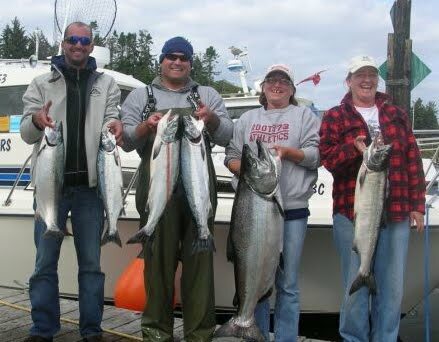 There's a coho derby in Sooke on October 8th -- $30 per rod. The 1st Annual Thanksgiving Coho Derby in Sooke on Saturday, October 8 from dawn to 2:00 p.m. weigh-in will be at the Crab Shack located at Jock's Dock starting at 10:00 a.m. with final weigh-in at 2:00 p.m. at which time the winner will be announced. This derby is a winner take all event. Tickets are $30 per rod with $20 going to the winner take all pot the rest going to the Charters Creek Salmon Habitat Restoration. Also the derby will be taking donation of non-perishable items for the local Sooke Community Food Bank as well their will be a draw prize for anglers who donate a fish to the food bank. Their will be a number of hidden weight prizes and Kids cash prize for biggest Coho for a kid 15 and under. Should be a good time and with the chance of catching a wild Coho makes for a good time. For tickets contact the Crab Shack 250-642-4410, Eagle-Eye in Sooke and Island Outfitters in Victoria. Get out there and catch a salmon while the weather is still nice!